White paper on crime 2004 Part5/Chapter5/Section2/3. This section will describe parolees and probationers placed under supervision for Stimulant Drug Control Law offenses. Fig. 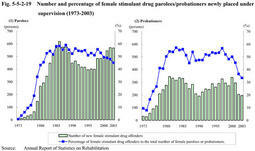 5-5-2-17 shows the number of stimulant drug parolees/probationers newly placed under supervision since1973.The number of stimulant drug parolees increased significantly during the early1980s and then temporarily decreased.It has largely leveled off in recent years with minor fluctuations,standing at4,025in2003.On the other hand,the number of stimulant drug probationers has been declining in the last three years to 623 in 2003. Fig. 5-5-2-18 shows the average ages of stimulant drug and other parolees/probationers in the past 10 years.On average,stimulant drug parolees and probationers were younger than other ones. Fig. 5-5-2-19 shows the number of female stimulant drug parolees/probationers newly placed under supervision and their proportion to the total new female parolees and probationers.The number of female stimulant drug parolees has increased considerably in recent years.Stimulant drug offenders accounted for about50%of the total new female parolees. Fig. 5-5-2-20 shows a breakdown of new stimulant drug parolees/probationers by length of supervision period.The supervision periods for most probationers were to be more than two years.On the other hand,most parolees were to be under supervision for one year or shorter,and two thirds were to be for six months or shorter. Fig. 5-5-2-21(1) shows a breakdown of new stimulant drug parolees by imprisonment records.In recent years,the percentage of those imprisoned for the first time has stayed around50%,standing at50.4%in2003. Fig. 5-5-2-21(2) shows a breakdown of new stimulant drug probationers by criminal records.Those with no previous convictions have accounted for about50%of the total. In general,stimulant drug offenders are likely to repeat similar offenses due to their addiction to drugs.The especially high reimprisonment rate of stimulant drug prisoners was pointed out in this part, Chapter3,Section2,4 (see Table 5-3-2-39 and Table 40 ),and the high revocation rate of suspended sentence for stimulant drug offense was also mentioned in Part2,Chapter3,Section3,5.Since drug offenders usually use drugs secretly without causing direct harm to other people,it is difficult for ordinary probation/parole supervision to detect or to prevent their drug use. Despite such difficulty,most stimulant drug offenders can potentially be rehabilitated,if given the proper treatment,because they are relatively young and have little or no other criminal record.Probation offices have been therefore making special efforts in exercising supervision over stimulant drug offenders,taking a combination of various measures on a case-by-case basis.For instance,volunteer probation officers regularly visit drug parolee/probationers to check their actual situations.Probation officers become involved with them at an early problematic stage,give them intensive guidance on their friendships,lifestyles,and jobs,teach them about the hazards of drugs,and cooperate with relevant organizations such as Mental Health and Welfare Centers,public health centers,psychiatric treatment institutions,private drug addiction rehabilitation institutions,and self-help groups of drug addicts. The family members and other guarantors living with drug offenders play very important roles in preventing their drug use.They can be victims and,at the same time,supporters of their drug abuse.They have suffered from the offender's drug abuse,but sometimes have ended up helping their drug abuse by repaying their debts,solving their troubles on their behalf,easily accommodating their requests for pocket money,or being intimidated into giving them money.It is,therefore,important to take into consideration those two aspects of drug users'family members.They need proper guidance as to how to deal with offenders and also a sympathetic ear for their worries and sufferings.For this purpose,an increasing number of probation offices have held lectures and round-table discussions called"guarantor meetings"for guarantors of stimulant drug offenders while the offenders are imprisoned.In those meetings,the purpose of probation/parole and the importance of the guarantors having a proper attitude toward drug users are explained by probation officers,and lectures on drug problems are given by invited drug experts or by audio-visual educational materials.Also round-table meetings and individual meetings are held to share their suffering and matters to heed.In FY2003,21offices held a total of32guarantor meetings(Source:Rehabilitation Bureau,Ministry of Justice). In addition,simple urine tests have been implemented since April2004,mainly on stimulant drug parolees who agree to take them.It is designed to support their efforts to stop drug use.Further information on the system will be given later(see this chapter, Section4,2 ).